Glow tape absorbs and stores energy from ambient light sources, including incandescent light and fluorescent lamps. It becomes easily visible in sudden darkness. Applying Glow Tape to floors, walls, stairways, handrails, doors, and support beams is an easy and inexpensive method of enhancing safety. 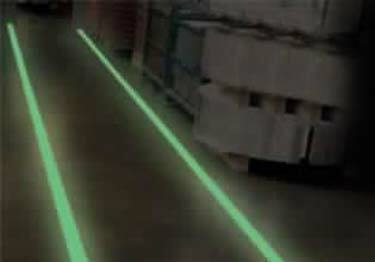 Glow Tape is highly visible for first 30 minutes after exposure to ambient light has ceased, and will remain visible in a totally dark room to an adapted eye for up to 6 hours. The photoluminescent characteristic of Glow Tape is the result of a non-radioactive chemical reaction . This photoluminescent agents are embedded onto a flexible vinyl film laminated with an adhesive backing. Glow can be charged for use in 10 minutes of continued exposure to any light source but must be charged for a full 6 hours in order to glow for the maximum 6+ hours of glow to the light adjusted eye. How well does it work for outdoor stairs? We would like to use this tape in a room where we mix inks with solvents. We are wondering how long this product will hold up.